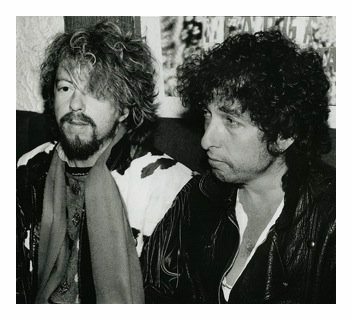 “Worth The Waiting For” by Bob Dylan and Dave Stewart. And a bit more fun. The song “Worth The Waiting For” by Bob Dylan and Dave Stewart- appears on Stewart’s album The Blackbird Diaries… this is Dave Stewart, Bob’s long time friend who is perhaps most well known for being part of the Eurthymics. Here is the song … there are two slightly different versions available so I’ve put both up just in case you really do like the song. In effect I don’t think it is the only Stewart/Dylan co-composition, because “Gypsy Girl and Me” supposedly by Dave Stewart is in fact Bob Dylan’s “On the Road Again” with new lyrics. It is to my ear is a lot more fun that “Worth Waiting For”. The album containing “Worth the Waiting For” was released in June 2011, but the song was written long before that, as I will try and explain. There is no mention of the “Worth The Waiting For” song in Heylin, but Stewart has provided us with an explanation. The lyrics are not Bob’s at all as you can, I am sure, immediately ascertain from the transcript below. Who loved you all the time? If I still had you on my mind? I could have been your greatest friend? Would eat you up again? In relation to those songs I have written elsewhere on this site that “my take on this is that all these songs were originally written (or at least Dylan’s input into the songs was completed) in 1985 while Dylan was writing songs for Empire Burlesque.” So I am placing it in the interim period of that year – the pause between the two sets of Burlesque songs. The full details of the 1985 songs appears on the 1980s page and my review of 1985 (obviously written before I came across this song) appears here. This dating is backed up by the fact that the two guys have been friends for many a long year with Dave Stewart producing tracks for Bob Dylan. Of this friendship Dave Stewart is reported as saying, “We were always doing stuff but not really trying to play together or be a band. We recorded lots of stuff, sometimes in my church, sometimes in my kitchen, and put it down on cassettes.” If you want to follow this further there is an interview with Dave Stewart on line here. “In 1984 I was in a studio in L.A., recording and producing something, when the lady at reception rang through to the studio and said, “I have Bob Dylan on the phone for you.” I thought it was my friend joking, putting on a voice, because I’d never met him before, and I’d been a massive fan of his for years. “So when I actually heard him come on the phone I was about to say, “Stop laughing about,” but then he spoke and I was like, nobody could copy that voice, this really is Bob. “I had Dylan in a top hat and I shot it myself.And then we would jam with different friends. I had a studio in a church in North London, and we’d just choose different people, and have crazy sort of jam sessions. At one point there’d be like Joni Mitchell on drums, someone else on piano; everybody would swap around. “We did a lot of jam sessions in that church and we culled some of them, but I never with the intention of making a record. It was more just like how you do when you pop by to see a friend and have a jam session. “But sometimes we’d go back to my house and in the kitchen, we’d play it back on my cheap ghetto blaster. There’d be like twenty songs from every jam session, but there’d be no singing on them. And Bob would do this incredible thing – a genius in full effect — he would sing along and add melodies and bits of lyrics on top of all of them, just one after the other. “I had another cassette player that I could record what was turning out the ghetto blaster but also record the kitchen. So in my archives of recordings, I’ve got one that’s called “kitchen recordings,” and one of those songs, or beginnings, of songs was this thing I always liked. “When I was playing for the guys in Blackbird Studios with all those great players, about halfway through those sessions it sprung to mind. I listened to it on headphones and I thought this would sound killer played by these guys in a kind of country soul way. I listened to it and understood of it what I could, because they’re very bad recordings, and finished the song, kept some of the words that I could understand, and then wrote it into a song really about me and Annie. The index to the 500+ Dylan compositions reviewed is now on a new page of its own. You will find it here. It contains reviews of every Dylan composition that we can find a recording of – if you know of anything we have missed please do write in. 1 Response to “Worth The Waiting For” by Bob Dylan and Dave Stewart. And a bit more fun. It’s a good song…and certainly Worth The Listening To! I’m just not a big fan of Dave Stewart’s voice, it’s not strong enough or interesting enough to carry this. Still interesting to note that some of the lyrics might have been improvised by Bob!